Sephardic family. According to family tradition, its earliest known members lived in Toledo and Navarre in the eighth and ninth centuries. After having risen to high distinction in Navarre, largely through the merits of one of its members, Baruch ben Ishac ibn Daud (Don Bartolome), the family gravitated again to Andalusia, and produced a number of eminent men in Cordova in the tenth century, when that city, under the sway of the Ommiad califs, had become the center of wealth and culture. It flourished also in Seville, where a number of its members enjoyed the favor of the Ommiad rulers, and in Lucena, where they intermarried with the Ibn Ghayyats (or Ibn Giats). The irruption of the Almohades caused them to remove to Tudela in 1146, and during the century which followed they were successively in Navarre, Castile, and Aragon. They seem to have adopted the surname of De Sola toward the latter part of the twelfth century, only their Hebrew names appearing before that period. The name is said to have had its origin in an estate they possessed in northern Spain. During the thirteenth and first half of the fourteenth century the De Solas were in Aragon and Castile, and attained to high rank. The persecutions of the second half of the fourteenth century drove them to Granada. Here they remained till the edict of 1492 banished them from Spain. Members of the family were then scattered in many directions. Two brothers, Isaac de Sola and Baruch de Sola, crossed to Portugal, but persecution forced the elder brother, Isaac, almost immediately to seek refuge elsewhere. After suffering many vicissitudes in various countries Isaac's descendants settled in Holland early in the seventeenth century. Here they resided and prospered for several generations. But Baruch, the younger brother, finding the life of his wife endangered by the hardships endured, was forced to remain in Portugal, and avoided further persecution by professing to be a Marano. His family became largely interested in various enterprises then developing in the Portuguese Indies, but ultimately it rejoined relatives in Holland, where the children were trained in their ancestral faith. The connections which they had established with the Portuguese Maranos were, however, long maintained, and led some of the members of the family to occasionally risk visits to Lisbon and the Portuguese colonies in the pursuit of their enterprises, notwithstanding the dangers of the Inquisition. But early in the eighteenth century, when David de Sola, the head of the elder branch, and his family, under assumed names, reached Lisbon, he was seized and tortured by the Inquisition, and later his youngest two sons suffered death at an auto da fé. In 1749 his eldest son, Aaron, effected his escape from Portugal with his wife, five sons (David, Isaac, Jacob, Benjamin, and Abraham), and a daughter, and returned to Holland. Their first act was to openly avow their unshaken adherence to the faith of their forefathers. The descendants of the eldest son, David, have lived successively in Holland, England, and Canada. The second and third sons, Isaac and Jacob, went to Curaçao, and their descendants are yet on that island and in the United States and other parts of America. Arms of the De Sola Family. 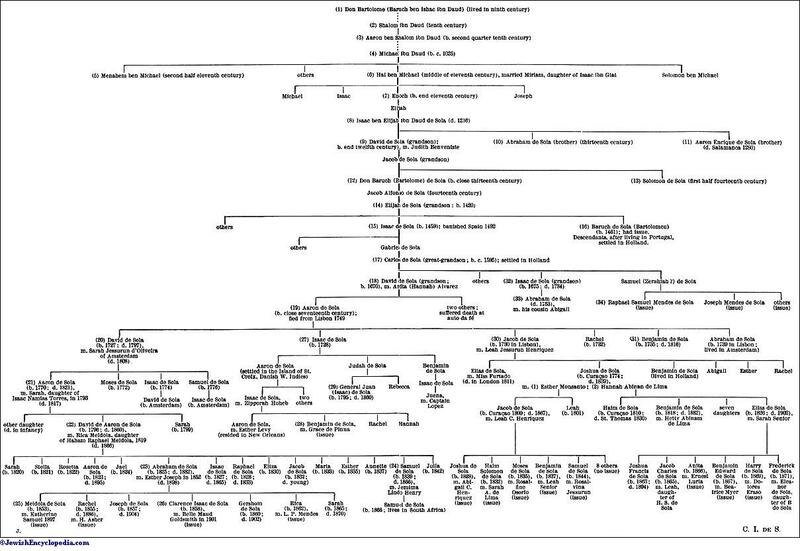 The accompanying pedigree shows the various branches and chief members of the De Sola family, the numbers in parentheses corresponding to those given in the text. Styled a "nasi"; progenitor of the De Sola family; is said to have occupied a high office of state in Navarre in the ninth century. Descendant of Don Bartolome (No. 1); lived in Cordova in the tenth century. Through the friendship of Ḥasdai ibn Shaprut he enjoyed the favor of the calif Abd al-Raḥman III. He was appointed a dayyan of the community of Cordova. Son of Shalom (No. 2); born in the second quarter of the tenth century; was a physician in Cordova. He is said to have been lecturer at the college of medicine established in that city by Al-Ḥakam II. Descendant in the male line of Aaron ben Shalom (No. 3); born in Seville about 1025. He was a physician and naturalist, and wrote a work, no longer extant, on the medicinal properties of plants. Eldest son of Michael ibn Daud (No. 4); lived in Seville and attained to a political position of responsibility at the court of King Al-Mu'tamid in the second half of the eleventh century. Second son of Michael ibn Daud (No. 4); born in Seville about the middle of the eleventh century; lived in Lucena, where he devoted himself to philosophy and theology. He married Miriam, a daughter of Isaac ben Judah ibn Ghayyat (or ibn Giat), and sister of Judah ibn Ghayyat, who influenced his studies; and he enjoyed the advantage of close association with Alfasi. Into his circle came also the young Judah ha-Levi, then a student at the Lucena college. Hai is said to have been the author of some writings on the Talmud and of a work on philosophy. He wrote also a brief commentary on the Megillot. He had four sons, Michael, Isaac, Enoch, and Joseph, who lived in Lucena and Cordova until the invasion of the Almohades caused them to go to Tudela in 1146. Third son of Hai (No. 6); born at Lucena at the end of the eleventh century. He was the author of a work on astronomy. He died at Tudela, where he had acted as dayyan. Grandson of Enoch ben Hai (No. 7); born in the middle of the twelfth century. Isaac de Sola was a rabbi and one of the heads of the Jewish communities of Navarre. He was also a commentator and poet, and made Hebrew renderings of Arabic poems. He died 1216. Grandson of Isaac ibn Daud de Sola (No. 8); born about the close of the twelfth century; lived in Barcelona. He was a man of learning and wealth, and by his munificence greatly encouraged Hebrew scholarship in his native city. Family traditions mention him as the author of a work on the Mekilta and of several theological writings. He married Judith Benveniste. During the second half of the thirteenth century some of his relatives settled in Narbonne, Montpellier, and other parts of southern France, but his descendants in the main line continued in Spain. Lived in the thirteenth century; a brother of David de Sola (No. 9). He was a distinguished physician, and was employed by Alphonse, Count of Poitou and Toulouse, brother of Louis IX. of France. Lived in the thirteenth century, and was a brother of David (No. 9) and of Abraham (No. 10); died at Salamanca 1280. He devoted his life to the study of science, and is said to have written works on astronomy and mathematics. His earlier years were spent at Barcelona and Saragossa, but later he went to Toledo at the invitation of Alfonso X. of Castile, el Sabio. Great grandson of David de Sola (No. 9). Don Baruch was born at the close of the thirteenth century, either at Barcelona or at Saragossa. Family tradition records that he won distinction fighting as a knight under the infante Alfonso, afterward Alfonso IV. of Aragon. He took part in the war against the Shepherds, 1320-22, and in the war in Sardinia, 1325-30. He was accorded noble rank by the king. After the death of Alfonso IV. he went to Toledo, where he died. His son, Jacob Alfonso, lived in Toledo for a while, but outbreaks of intolerance caused him to remove to Granada with his family. Flourished during the first half of the fourteenth century. He was a son of the Jacob de Sola who was a great-grandson of David (No. 9), and was a brother of Don Baruch (No. 12). He was a physician at Saragossa and also a rabbinical scholar. Born in Granada 1420; was a grandson of Jacob Alfonso de Sola, the son of Don Baruch (Bartolome) (No. 12). He was a rabbi and wrote lectures on Hebrew grammar. Son of Elijah (No. 14); born in Granada in 1459. He took part in the defense of his native city, and left it on its fall. The expulsion of the Jews from Spain in 1492 drove him to Portugal. His descendants took up their abode in Holland a century later. Among his children was a son named Gabriel, referred to below. Born about 1595; great-grandson of Gabriel de Sola, the son of Isaac de Sola (No. 15). He went to Holland in the first half of the seventeenth century. He was the writer of a family Chronicle (in manuscript). Grandson of Carlos de Sola (No. 17); born about 1670. His youth was spent chiefly in Holland, although it is uncertain whether he was born there. Through his cousins, the descendants of Baruch (No. 16), he became associated with some of the Maranos of Portugal in extensive mercantile transactions, being interested with them in ships engaged in Portuguese and Dutch commerce, whereby he attained to a position of considerable affluence. He visited Lisbon apparently more than once, and took up temporary residence there, passing as a Marano, usually under the name of Bartolomeu, in a vain attempt to allay the suspicions of the Inquisition. Arrested on a charge of secret adherence to Judaism, he was subjected to the horrors of the torture chamber. But nothing could be wrung from him, and eventually he was released. Broken in health by the awful sufferings he had undergone, he died soon afterward. Son of David de Sola (No. 18); born about the close of the seventeenth century. He was in Portugal as a Marano under an assumed name when his father was tortured by the Inquisition. His position became yet more perilous when two of his brothers, likewise living under assumed names, were ferreted out by the officers of the Inquisition as relapsed Jews, and after cruel sufferings met death at an auto da fé in Lisbon. After some years of extreme danger Aaron succeeded in escaping from Portugal on a British ship in 1749. Landing in London, he and his family at once openly proclaimed their fidelity to Judaism. From London they went to Holland, and here Aaron de Sola spent his latter days. From his six children are descended the several branches of the De Sola family of to-day. His son Abraham, who was born 1737 or 1739, took an active part in administering the affairs of the Jewish educational and charitable institutions of Amsterdam. Aaron's daughter Rachel, born 1732, married a Cohen in Holland, and her children assumed the name of Cohen-de Solla. Among her descendants was Henri Cohen-de Solla, the musician; born 1837; died in London 1904. Son of Aaron de Sola (No. 19); born in Lisbon in 1727; died in 1797; fled from that city with his parents in 1749 and settled in Holland. He wrote a number of addresses and essays on religious subjects, and a volume of poems. He was married to Sarah Jessurun d'Oliveira of Amsterdam, who survived him ten years, and by whom he had four sons: Aaron (No. 21), Moses, Isaac, and Samuel. Son of David de Sola (No. 20); born in Amsterdam in 1770; died in that city in 1821. He was a Talmudist, and his name appearsin the family papers as the writer of a work on chronology. Minister and author; born at Amsterdam 1796; died at Shadwell, near London, 1860; son of Aaron de Sola (No. 21). When but eleven years of age he entered as a student the bet ha-midrash of his native city, and after a course of nine years received his rabbinical diploma. In 1818 he was elected one of the ministers of the Bevis Marks Congregation, London. De Sola's addresses before the Society for the Cultivation of Hebrew Literature led the Mahamad to appoint him to deliver discourses in the vernacular, and on March 26, 1831, he preached the first sermon in English ever heard within the walls of Bevis Marks Synagogue. His discourses were subsequently published by the Mahamad. In 1829 he issued his first work, "The Blessings"; and in 1836 he published his "Translation of the Forms of Prayer According to the Custom of the Spanish and Portuguese Jews," in six volumes, of which a second edition was issued in 1852. This translation formed the basis for several subsequent ones. David de Aaron de Sola. In 1837 De Sola published "The Proper Names in Scripture"; about the same time he wrote "Moses the Prophet, Moses Maimonides, and Moses Mendelssohn"; and in 1838 "Notes on Basnage and Milman's History of the Jews." In 1839, collaborating with M. J. Raphall, he translated eighteen treatises of the Mishnah. The work had a strange fate, for, the manuscript having reached the hands of a member of the Burton Street Synagogue, it was published in 1812, without the permission of the authors, before it had been revised or corrected for the press, and with an anonymous preface expressing views entirely opposed to those of De Sola and Raphall. In 1840 De Sola, conjointly with M. J. Raphall, began the publication of an English translation of the Scriptures, together with a commentary. Only the first volume, "Genesis," was published, in 1844. De Sola was instrumental in organizing the Association for the Promotion of Jewish Literature and other societies of a similar character. In 1857 he published "The Ancient Melodies of the Spanish and Portuguese Jews," including a historical account of the poets, poetry, and melodies of the Sephardic liturgy. In the notation of the melodies he was assisted by Emanuel Aguilar, the composer. In 1860 De Sola translated into English, in four volumes, the festival prayers according to the custom of the German and Polish Jews. Besides his works in English, De Sola wrote in Hebrew, German, and Dutch. He contributed frequently between 1836 and 1845 to the "Allgemeine Zeitung des Judenthums" and to "Der Orient," and published in German "A Biography of Ephraim Luzzato" and a "Biography of Distinguished Israelites in England." His chief work in Dutch was his "Biography of Isaac Samuel Reggio," published in 1855 and afterward translated into English. David de Sola was married in 1819 to Rica Meldola, the eldest daughter of Haham Raphael Meldola, by whom he had six sons and nine daughters. 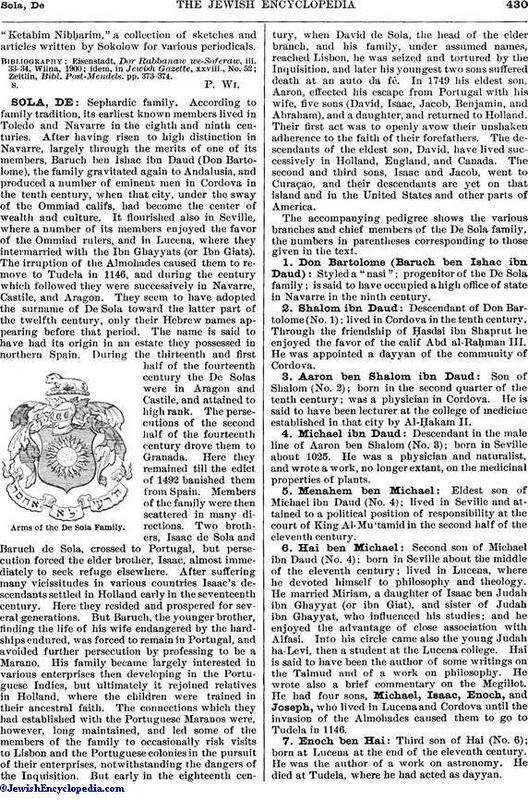 One daughter, Jael, married Solomon Belais, son of Rabbi Abraham Belais, at one time treasurer to the Bey of Tunis, and another, Eliza, married Rev. Abraham Pereira Mendes, and was the mother of Dr. Frederick de Sola Mendes and of Dr. Henry Pereira Mendes. Of the other daughters five married in London. Rabbi, author, Orientalist, scientist, and communal leader; born in London, England, Sept. 18, 1825; died in New York June 5, 1882. He was the second son of David de Aaron de Sola (No. 22) and of Rica Meldola. Having received a thorough training in Jewish theology, he early acquired a profound knowledge of Semitic languages and literature. In 1846 he was elected minister of the congregation of Spanish and Portuguese Jews of Montreal, Canada, and he arrived in that city early in 1847. In 1848 De Sola was appointed lecturer, and in 1853 professor, of Hebrew and Oriental literature at McGill University, Montreal, and he eventually became the senior professor of its faculty of arts. He was president of the Natural History Society for several years, and addressed its members frequently on those branches of scientific investigation which came within its province. The degree of LL.D. was conferred upon him in 1858 by McGill University. This was probably the first instance of a Jew attaining that honor in an English-speaking country. In 1872, by invitation of President Grant's administration, De Sola opened the United States Congress with prayer. The event was of significance, as De Sola was a British subject, and this was the first indication of a more friendly feeling between the United States and Great Britain after the dangerously strained relations that had been caused by the recently adjusted "Alabama Claims." Mr. Gladstone, then premier, as well as Sir Edward Thornton, the British ambassador at Washington, extended the thanks of the British government to De Sola. Abraham de Sola frequently visited the United States, and, through his pulpit addresses and numerous contributions to the press, became recognized there as one of the most powerful leaders of Orthodoxy, at a time when the struggle between the Orthodox and Reform wings of the community was at an acute stage. He was intimately associated with Isaac Leeser, Samuel Myer Isaacs, Bernhard Illowy, J. J. Lyons, and other upholders of Jewishtradition, and on the death of Leeser was invited to become successor to his pulpit; but this and many similar offers he declined. For twenty years he was a constant contributor to Leeser's "Occident," and after the latter's death he purchased the copyrights and stereotype plates of his works and continued their publication. 1852. A Commentary on Samuel Hannagid's Introduction to the Talmud. 1854. The Jewish Calendar System (conjointly with Rev. J. J. Lyons). 1857. Philological Studies in Hebrew and Aramaic. 1861. The Sanatory Institutions of the Hebrews. Part i. (parts ii. and iii. appeared the following year). 1869. Life of Shabbethai Tsevi. 1878. New Edition of the Forms of Prayer of the Spanish and Portuguese Jews, with English translation, based on the versions of David Aaron de Sola and Isaac Leeser. 1880. Life of Saadia Ha-Gaon. 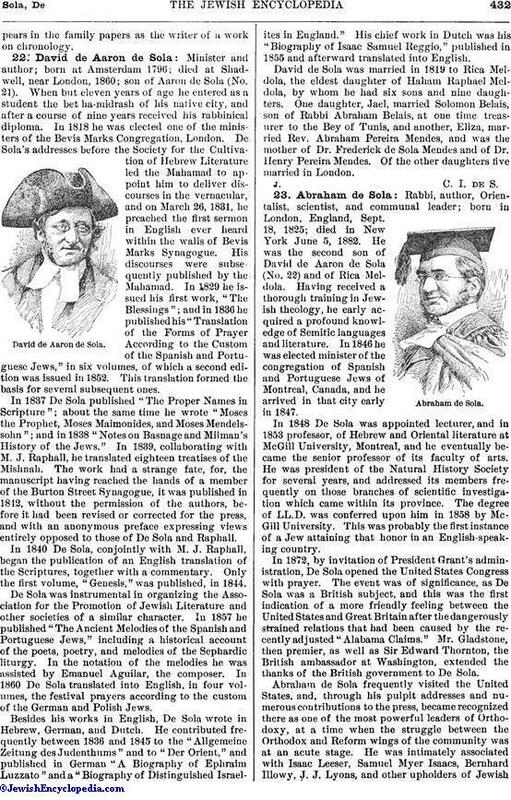 Abraham de Sola also contributed actively to the Jewish press, a large number of articles by him appearing in "The Voice of Jacob," "The Asmonean," "The British-American Journal," and other contemporary Jewish journals. His articles on Sir William Sawson's "Archaia," "Dawn of Life," and "Origin of the World" are specially noteworthy. He also edited and republished English's "Grounds of Christianity" and a number of educational works. Born in London in 1839; died there 1866; the youngest son of David de Aaron de Sola (No. 22). In 1863 he was elected to succeed his father as minister of the Bevis Marks Congregation. He composed a large number of melodies for the synagogue and home, which were widely adopted. Canadian rabbi; born in Montreal May 22, 1853; eldest son of Abraham de Sola (No. 23). His theological studies were pursued chiefly under the direction of his father, whose assistant he became in 1876. Meldola de Sola's election as his father's successor in 1882 checked the movement for Reform in his own synagogue. In 1898 he was appointed the first vice-president of the Orthodox Convention in New York, and he was one of the committee of three that drew up its "Declaration of Principles." At the conventions held in 1900 and 1903 he was elected first vice-president of the Union of Orthodox Jewish Congregations of the United States and Canada, and chairman of the Committee on Presentations of Judaism. In the latter capacity he issued in 1902 a protest against the Central Conference of American Rabbis for discussing the transfer of the Sabbath to the first day of the week. De Sola has written voluminously in the Jewish press in defense of Orthodoxy. Third son of Abraham de Sola (No. 23); born at Montreal, Canada, Aug. 15, 1858. He has taken an active part in the Zionist movement since its inception, and was largely instrumental in establishing it in Canada. He held the presidency of the Federation of Zionist Societies of Canada from 1899 to 1905, was elected member of the Actions Committee at the Fourth Congress, London, 1900, and at subsequent congresses, and is a Canadian trustee of the Jewish Colonial Trust. Since 1887 he has been managing director of the Comptoir Belgo-Canadien, the steel and construction trust of Belgium, and in that capacity he has constructed a number of Canada's public works, including many railway and highway bridges. His close association with the development of Belgium's industrial relations with Canada led to his appointment as Belgian consul at Montreal in 1905. Second son of Aaron de Sola (No. 19); born in Lisbon in 1728, and fled from that city to Holland with his parents in 1749. He settled in Curaçao and became largely engaged in the West-Indian trade. His descendants live mainly in the West Indies and the United States. Grandson of the eldest son of Isaac de Sola (No. 27). He resided in the Southern States at the time of the Civil war, and, joining the Confederate army, acquitted himself with credit in a number of engagements. Born about 1795 at Curaçao; died 1860; the son of Judah, the second son of Isaac de Sola (No. 27). In 1817 he went to Angostura (Ciudad Bolivar), Venezuela, and, joining the editorial staff of the "Correo de Orinoco," attracted the support of the patriots by his articles. On the outbreak of the revolt of the South-American colonies from Spain he joined the army of the patriots, and his bravery and capacity led General Piuango to promote him to the general staff. He was attached to the army of Apure, under General Paez, and advanced to the rank of lieutenant-colonel in the army of Colombia (formed then of the republics of Venezuela, New Granada, and Ecuador). On June 24, 1821, he took part in the decisive battle of Carabobo, which sealed the independence of Colombia. Valencia surrendered, and the revolutionary forces under Paez marched on Puerto Cabello, De Sola joining in the expedition. On Nov. 7 and 8, 1823, occurred the storming of Puerto Cabello by General Paez. De Sola took part in the assault, in command of cavalry, and drove the Spaniards before him to the sea, receiving himself a saber-cut across the face, the scar of which he carried till his death. De Sola was a faithful supporter of Paez throughout his career, and from 1826 to 1830 assisted him in his policy of separating Venezuela from Colombia. In 1830 he attained his full colonelship, and was on Paez's staff, seemingly for a while as chief of staff. In 1843 he retired temporarily from the army, and became proprietor and editor of "El Gaceta Carabobo" and "El Patriota" in Valencia. After Paez'sfall in 1848 and the accession of General Monagas, De Sola withdrew to private life for several years. On March 5, 1858, De Sola commanded the second division of the revolutionary army that overthrew General Jose Tadeo Monagas, and in recognition of the important part he had taken he was created a general by the new government in 1859. Third son of Aaron de Sola (No. 19); born at Lisbon in 1730, where he bore the name of Bartolomeu. After escaping from Portugal he went to Curaçao, where he joined his brother Isaac in West-Indian commerce. His descendants are settled in Curaçao and other parts of America. 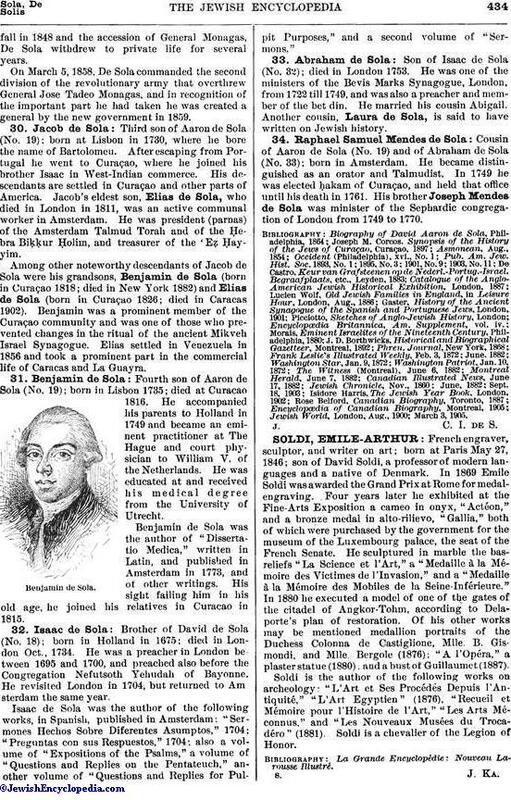 Jacob's eldest son, Elias de Sola, who died in London in 1811, was an active communal worker in Amsterdam. He was president (parnas) of the Amsterdam Talmud Torah and of the Ḥebra Biḳḳur Ḥolim, and treasurer of the Eẓ Ḥayyim. 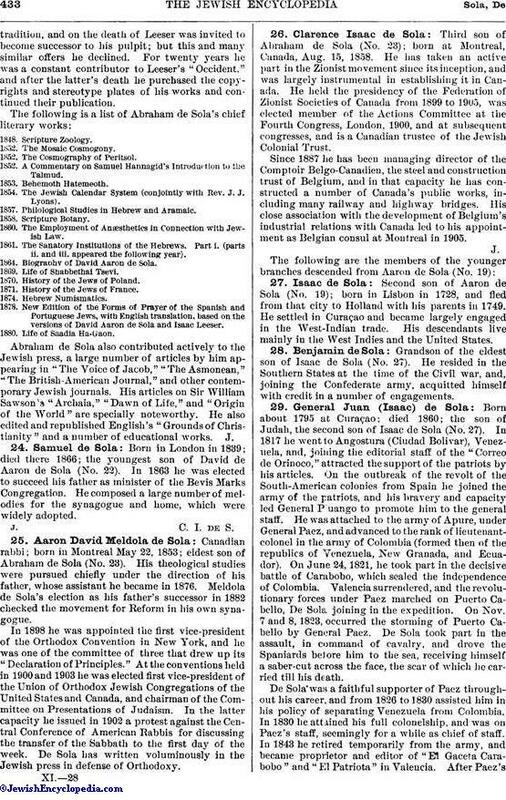 Among other noteworthy descendants of Jacob de Sola were his grandsons, Benjamin de Sola (born in Curaçao 1818; died in New York 1882) and Elias de Sola (born in Curaçao 1826; died in Caracas 1902). Benjamin was a prominent member of the Curaçao community and was one of those who prevented changes in the ritual of the ancient Mikveh Israel Synagogue. Elias settled in Venezuela in 1856 and took a prominent part in the commercial life of Caracas and La Guayra. Fourth son of Aaron de Sola (No. 19); born in Lisbon 1735; died at Curaçao 1816. He accompanied his parents to Holland in 1749 and became an eminent practitioner at The Hague and court physician to William V. of the Netherlands. He was educated at and received his medical degree from the University of Utrecht. Benjamin de Sola was the author of "Dissertatio Medica," written in Latin, and published in Amsterdam in 1773, and of other writings. His sight failing him in his old age, he joined his relatives in Curaçao in 1815. Brother of David de Sola (No. 18); born in Holland in 1675; died in London Oct., 1734. He was a preacher in London between 1695 and 1700, and preached also before the Congregation Nefutsoth Yehudah of Bayonne. He revisited London in 1704, but returned to Amsterdam the same year. Isaacad de Sola was the author of the following works, in Spanish, published in Amsterdam: "Sermones Hechos Sobre Diferentes Asumptos," 1704; "Preguntas con sus Respuestos," 1704; also a volume of "Expositions of the Psalms," a volume of "Questions and Replies on the Pentateuch," another volume of "Questions and Replies for Pulpit Purposes," and a second volume of "Sermons." Son of Isaac de Sola (No. 32); died in London 1753. He was one of the ministers of the Bevis Marks Synagogue, London, from 1722 till 1749, and was also a preacher and member of the bet din. He married his cousin Abigail. Another cousin, Laura de Sola, is said to have written on Jewish history. Cousin of Aaron de Sola (No. 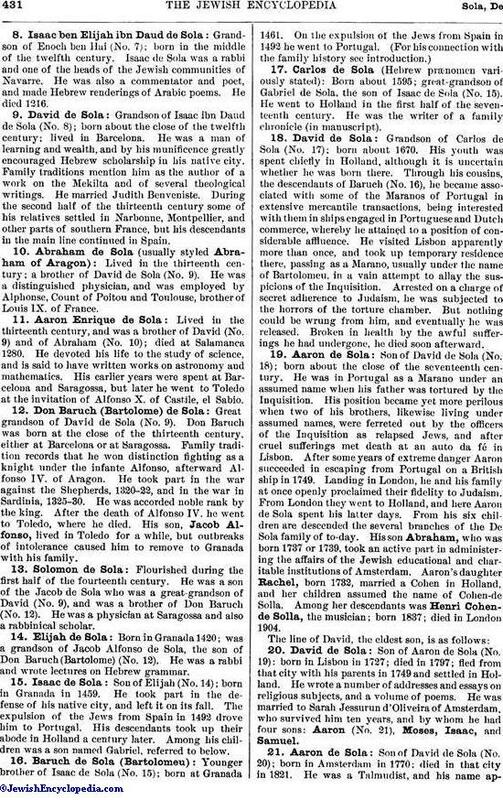 19) and of Abraham de Sola (No. 33); born in Amsterdam. He became distinguished as an orator and Talmudist. In 1749 he was elected ḥakam of Curaçao, and held that office until his death in 1761. His brother Joseph Mendes de Sola was minister of the Sephardic congregation of London from 1749 to 1770. Jewish World, London, Aug., 1900; March 3, 1905.